Last time we talked about ice dams and how to prevent them. But your roof isn’t the only place snow and ice can wreak havoc. These elements can also pose a hazard on sidewalks, driveways and around your garage door. According to Toronto Municipal Code 719-2, property owners have twelve hours after the fall of snow, rain or hail to “clear away and completely remove snow and ice from any sidewalk on a highway in front of, alongside or at the rear of the building.” If removing the snow and ice leaves the sidewalk slippery, the owner or occupant is charged with applying ashes, sand, salt or another appropriate material to the surface to “completely cover the slippery surface.” Property owners who fail to comply with this edict are subject to fines and open to slip-and-fall lawsuits. So how can you protect yourself and others? 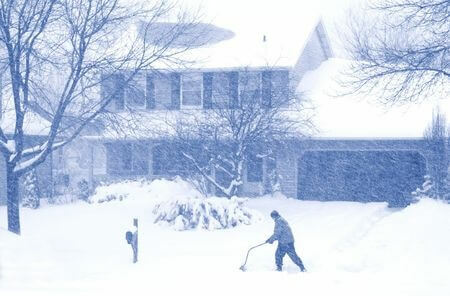 The best way to prevent snow and ice buildup is to shovel during the snowfall, whenever possible. While it’s true this may require shoveling a second time, your arms and back will thank you for the lighter load. A push broom can be used to remove light dustings of snow. If ice has already formed on the sidewalk, use a garden edger or metal pick to break through ice. Clear the snow down to the pavement. Then apply your ice-melt product of choice to provide traction. Rock salt, though cost-effective, corrodes automobiles, damages concrete, contaminates waterways and is harmful to trees and plants. Ammonium nitrate and ammonium sulfate break down masonry materials.Ice melt products, like those containing calcium chloride require less product to get the job done. However, these products eventually make their way to waterways. Sand is inexpensive and easily accessible. Brick sand, which is coarser, is the best option. However, it can easily be tracked into the house. Provide an area for boot and shoe removal just before or after the entryway to your home to avoid this. Ashes from a wood burning fireplace are another convenient option. Do not use ashes near gardens, as heavy metals may be present. Kitty litter, while more expensive, is an option which provides excellent traction. Looking for the best environmental choice? EcoTraction, a green-colored, all-natural volcanic mineral that doesn’t contain salt, chlorides, chemicals or dyes, is an environmentally-friendly choice. The product is touted as completely safe for use around children, pets, plants and wildlife. If you’re building a new home or replacing your driveway, in-ground heat mats prevent snow and ice from building on the driveway without shoveling, snow blowing, scraping or the use of ice-melting chemicals. Keep the area around your garage door free from ice and snow to prevent the bottom seal from sticking to the ground. Apply silicone spray to the rubber seal to prevent it from sticking. Cooking spray and vegetable oil will also work. Open the garage door periodically during bad weather, to keep it from sticking. What if your garage door is already frozen shut? Don’t keep trying to lift the garage door with the automatic opener, as this could burn the motor out or strip the gears. Pull the release cord, which allows you to manually open the garage door. Don’t try to force the door open, as this could rip the bottom seal from the door. From outside the garage, try breaking up the ice by using an ice scraper between the bottom of the door and the concrete. Use a hair dryer or heat gun set on low to melt ice. Don’t concentrate on one spot for too long. Managing snow and ice during winter weather can be tedious, hard work. However, the cost—in possible fines, injuries and property damage—make preventing the buildup of snow and ice on sidewalks, driveways and around your garage door worthwhile.